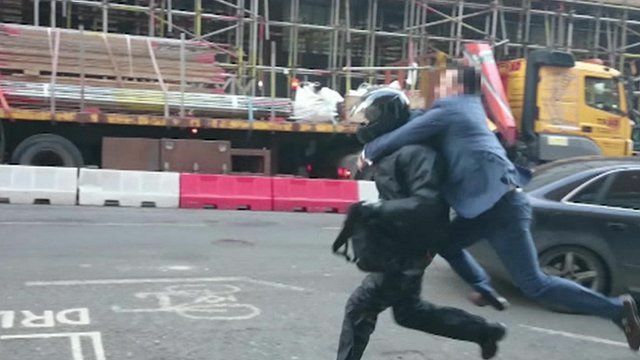 Footage has been released of the moment when a bystander tackled a machete wielding robber after a smash-and-grab raid on a luxury City of London jewellers. City of London Police and armed officers were alerted to the incident on Liverpool Street just after 14:30 GMT on Thursday. Three men on mopeds reportedly used sledgehammers to smash the shop windows before fleeing. Officers chased three of the men to a car park in Gravel Lane where one man was arrested. The two others remain on the run. The force said a sledgehammer and the machete were recovered and there were no reports of any injuries.